The European Tour have announced that the Aberdeen Asset Management Scottish Open will return to Gullane Golf Club next year. Three years after Rickie Fowler's thrilling victory at the East Lothian links, Scotland’s National Open will return to Gullane for the second time from July 12-15, 2018. While it may be surprising that the tournament is reutrning to Gullane so soon, it makes sense when we learn that the European Tour and LET have combined in a similar fashion to this year. Next year's event will be followed two weeks later by the Aberdeen Asset Management Ladies Scottish Open played over the same course from July 26-29, 2018. Keith Pelley, Chief Executive of the European Tour, said: “We’re delighted to be returning to Gullane Golf Club next year, at an exciting time in the history of the tournament. Martin Gilbert, Chief Executive of Aberdeen Asset Management said: “We had a great tournament with a great winner in Rickie at Gullane in 2015 and we anticipate equally worthy winners of the men’s and ladies editions this year at Dundonald. Stars such as Rory Mcilroy, Rickie Fowler and Adam Scott have already confirmed their attendance at this year’s Aberdeen Asset Management Scottish Open at Dundonald Links in North Ayrshire, which forms part of European Tour’s new Rolex Series - a premium category of tournaments on the Race to Dubai that each have a minimum prize fund of US$7million. In addition, golf fans in Ayrshire can now look forward to more memorable moments in the company of many of the world’s best female golfers, with this year’s Aberdeen Asset Management Ladies Scottish Open at Dundonald Links now co-sanctioned by both the LET and LPGA for the first time. In a joint statement, LET Chief Executive Ivan Khodabakhsh and LPGA Commissioner Mike Whan commented: “Aberdeen Asset Management and Visit Scotland have done an excellent job of elevating this tournament for both Tours and we are both very proud, together with our Members, to be their partners." "Their strategy of playing two weeks after the men’s Scottish Open and providing the best female golfers from both Tours the ability to play in Scotland the week before the RICOH Women’s British Open is extremely positive for our Members. Paul Bush, Director of Events with VisitScotland, said: “Gullane Golf Club is home to three of Scotland’s finest links courses and will provide an outstanding venue for both the Aberdeen Asset Management Scottish Open and Ladies Scottish Open in 2018. " Golf fans can enjoy two world-class fields for the price of one this July at Dundonald Links when The Aberdeen Asset Management Scottish Open (July 13-16) and the Aberdeen Asset Management Ladies Scottish Open (July 27-30) are played over the space of a fortnight on the Ayrshire coast. 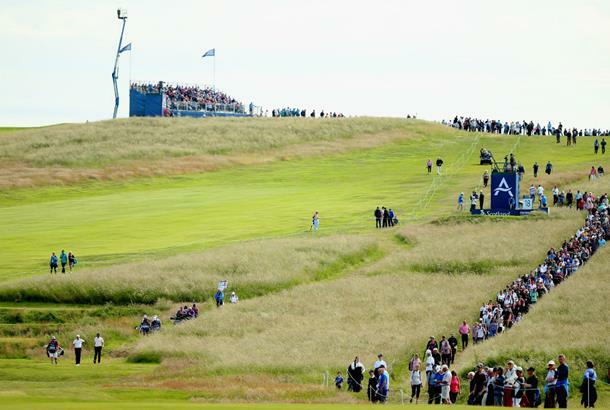 For every purchased ticket through – www.aamscottishopen.com/tickets – spectators will receive FREE entry to the Aberdeen Asset Management Ladies Scottish Open.